Decatur ~ Finis Eugene “Gene” Fluker, 91, a retired Baptist Minister, went to be with our Lord Monday, July 23, 2018 in Bowie. Funeral is 11:00 a.m. Friday, July 27, 2018 at First Baptist Church Decatur with burial in Cottonwood Cemetery. Family will receive friends 1 hour prior to service. Ken May and Gerre Joiner will officiate. Pallbearers include Louis Dooling, Randy Slimp, Timothy Slimp, Brent Payton, Kendall Payton, and Brian Dooling, Dalton Kobs. Finis was born on August 8, 1926 to David and Rena (Sheets) Fluker in Corsicana, Texas. He was united in marriage to Etta Mae Gilliam on March 11, 1946 at the First Baptist Church in Corsicana, Texas. They were married for 67 years. 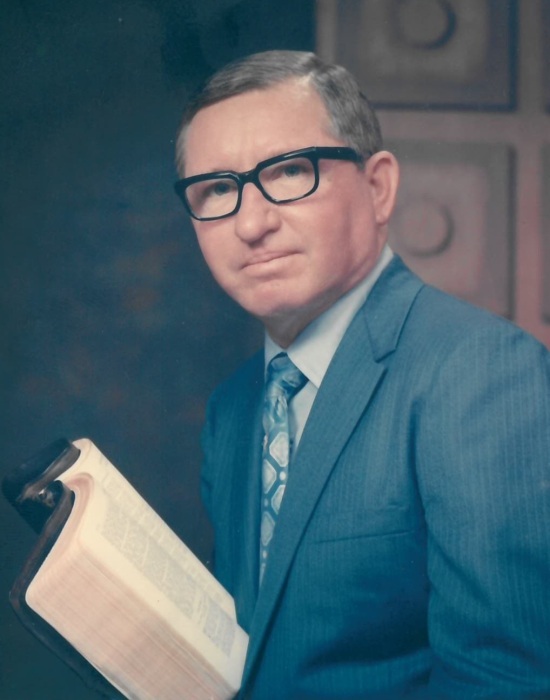 In 1948 he surrendered to the Gospel Ministry and began his 65 plus years as a teacher and pastor in several states until his retirement in 2015. Finis enjoyed fishing and the outdoors. Finis (Gene) was preceded in death by his wife, Etta Mae; and his son, Tarrant Eugene; his sisters, Dorothy and Edna Mae; and his parents. Those left behind to cherish his memory are his daughter, Margaret Dooling and husband Louis of Decatur; his grandchildren, Georgetta Slimp and husband Randy of Decatur, Katie Payton and husband Brent of San Antonio,, and Brian Dooling and wife Tina of Houston; his great grandchildren, Amelia Slimp, Timothy Slimp, Courtney Payton, Kendall Payton, Ashlee Dooling, Kohltyn and Tristin Dooling; his great great granddaughter Emma Alexis; his sisters, Ann, Elaine, Jonnie, Jo, Jane, Ruby; his brother, David; numerous nieces, nephews, cousins, and a host of friends.